Soon after Prince Henry’s death in 1460, Portuguese settlers moved to the Cape Verde Islands and set up a new base of operations similar to the base in Madeira for trading slaves, gold, and eventually ivory. Trade along the African coast had doubled since 1458. As we know, Henry the Navigator left his monopoly of the Guinea trade and his titles to his nephew, Fernando of Beja, “whom he had loved with fatherly affections.” Fernando became Fernando of Viseu. He also inherited Henry’s position as Master of the Order of Christ. This made Fernando a very powerful man because he was already Master of the Order of São Tiago. The position had been passed from his Uncle João, to João’s son Diogo, and then to him. Part of Fernando’s job as Master of the Order of Christ was to oversee the Atlantic Islands that the Order owned: Madeira, Pôrto Santo, Cape Verde, São Tomé, and the Azores. However, neither Fernando or his brother King Afonso V were as personally involved with finding a southern route to the Indies as Henry had been. They delegated the task to other people. They offered to Lisbon entrepreneurs and ship owners licenses for taking advantage of the monopoly. A merchant named Fernão Gomez(1) paid 200,000 reis [royal coins] to King Afonso and 100,000 reis to Fernando per year for four years for the license. The license came with one condition: Fernão Gomez’ captains were required to explore 100 leagues of new coast every year. Not until 1469, nine years after Pedro de Sintra discovered Sierra Leone, were any new records broken. Fernão do Pó, who worked for Fernão Gomez [possibly these two men were one and the same] discovered an island he named Formosa Flower [Beautiful Flower] just west of today’s Cameroon. The Portuguese would rename it Fernando Pó Island when they took possession of it in 1494 and turned it into an important trading post. [See the map above.] Since the mid-1900s, the mountainous volcanic island has been called Bioko [aka Bioco] and is still occupied by the indigenous Bubi people. From Formosa Flower, Fernão do Po pushed southeast and broke another record by crossing the equator. Then he ran out of supplies and returned home. The leadership of Portugal’s exploration project changed hands again in 1470 when Fernando of Viseu died. 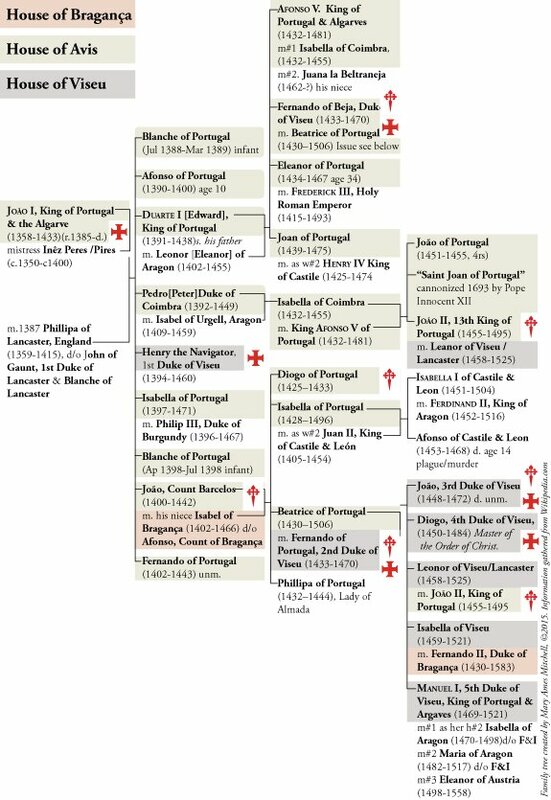 All his titles: Master of the Order of Christ, Master of the Order of São Tiago, and Duke of Viseu, passed to his oldest son João, known as João of Viseu [different from Prince João and João of Barcelos]. Only two years later, in 1472, João of Viseu died. The masterships were separated. The position of Master of the Order of Christ went to João’s younger brother, Diogo of Viseu. Since Diogo was only ten, his mother Beatrice of Portugal acted in his place. This is important to our story because it means Beatrice of Portugal, as the widow of Fernando of Viseu, was in charge of Terceira Island and the rest of the Azores from 1472 through 1478. As you shall see, those were key years during which explorers from the islands reach out to find “new llands” in the north Atlantic. Meanwhile, the position of Master of the Order of São Tiago went to the husband of João’s sister Leanor, who happened to be the crown prince João, King Afonso V’s son. Are you feeling dizzy again? Here is a family chart to sort it out. Since cousins married cousins, you will see some names repeated. The point of all this is that there was a huge shift in power. The Order of Christ had led the way for exploration under Henry the Navigator. They built the African trade, and as a result, they owned all the Atlantic Islands except the Canaries. After 1472 the Order of São Tiago held the patent for trade in Africa [as well as for most of the Algarve] and would own future discoveries. A different cross decorated the sails of their caravels and carracks. It is not clear how or if Fernão Gomez was related to Diogo Gomes, who was by that time working in the household of Fernando of Viseu.